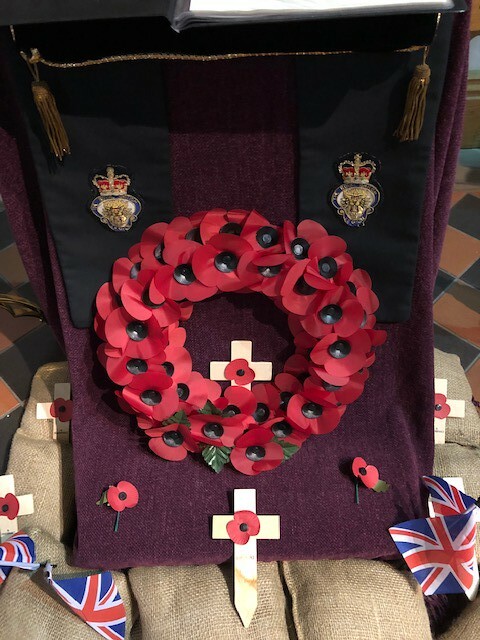 Parishes across the Diocese took time to remember and reflect on the great losses and pain of WW1 on the 100th anniversary of the Armistice signing. In his homily, preached at the Masses at St Chad’s Cathedral this weekend, Deacon Kevin Lawrie (Motherwell Diocese). He said: “This month of November is when the Church asks us to pray in a special way for those who have died. We are asked to remember them and ask God to welcome them into eternal life with Him. “We are praying for all those people who maybe in purgatory awaiting the everlasting light of the love and mercy of God the Father to shine upon them. “Today we are asked specifically to pray for and remember those who died as a result of war and conflict throughout the world. On Thursday 8th November at St Gregory’s in Stratford Upon Avon, the Holy Hour was dedicated for Peace and the Dead of World War 1. The Parish Priest, Fr Alex Austin OSB, was joined by parishioners as they reflected on the Armistice Day. Parishioners at Holy Trinity, Newcastle-under-Lyme, crocheted hundreds of poppies for an Armistice Anniversary display. “We shall not forget them”. Between 1939 and 1945 a further 109 members served in the conflict. The children at St Joseph’s in Stourbridge have been working on a project to remember former pupils who fought and died during World War 1. Each class from year 2 to year 6 has looked at the life of one of the men on the memorial and written about them. Examples of their work is displayed in Our Lady and All Saints Church, Stourbridge together with a waterfall of poppies to symbolise the millions of lives lost in wars and conflicts around the world since 1914. The parishioners of Saint Ambrose's in Kidderminster hand knitted and crocheted poppies for a display to mark Remembrance Day. There were nearly 1,000 poppies in the display, to commemorate the 100th anniversary of the ending of the First World War. The red poppies were for those who fell in that war, the purple and blue poppies represented the horses and dogs who died in the war. There was also a single white poppy for those who were shot at dawn. As well as the beautiful cascade of poppies beside the memorial in church, there was also a book on display. Entitled 'Saint Ambrose’s Fallen Parishioners of the Great War 1914-1918' this was produced by parishioners Michael Bradley and Thomas Roy. After years of collating information and finding out where the soldiers were buried, Mr Bradley discovered that the Carpet Museum had some Shuttle newspapers from the period of 1914 to 1919. With the help and collaboration of Mr Roy, they began to compile a book to commemorate the fallen parishioners. In it they now had letters, poetry and pictures. They were supported throughout by Father Lamb, who encouraged them to get the book published.